In life, most people will encounter a few transformative events that tend to change one’s perspective and sense of priorities. Becoming a parent is one. Surviving a serious health crisis is another. At the young age of 24, Ian Senior experienced both of these life-altering events at the same time, and he will be the first one to say he is a better man because of it. Senior and his wife, Stacy, announced their first pregnancy to their family on Thanksgiving Eve 2013. Later that night, Senior noticed a lump on the side of his neck. After ultrasounds, a CT scan and, finally, surgery to remove the lump, Ian received his official diagnosis: Stage 2 B cell non-Hodgkin’s lymphoma. Treatment began under the care of Dr. Nilesh Patel at Geisinger Scenery Park in State College. Ian’s treatment included bone marrow testing, port placement, PET scans and six rounds of chemotherapy. Through it all, the Seniors remained positive. That “something” was, of course, the upcoming birth of the couple’s son, Owen, who arrived on July 10, 2014 — exactly one month after Ian received his last treatment. Despite warnings that they may not be able to have another child due to the lasting effects of the chemo, the couple welcomed daughter Maura 18 months ago. 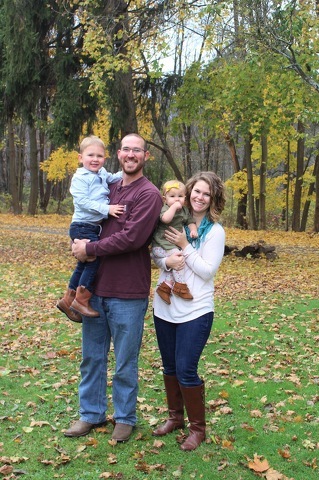 Becoming a cancer survivor and a father has led Ian to make some big changes, including giving him the courage to leave a job working in commercial concrete at HRI Inc. in order to start his own business: Ian Senior & Son Construction, which he runs from the couple’s Curwensville home. The Seniors hope people will take away several lessons from their story. They feel their experience can serve as a reminder to men to listen to their loved ones when it comes to taking care of their health. “If she hadn’t told me to get it checked out, I would have just thought I pulled a muscle in my neck or something and I wouldn’t have done anything about it,” Ian said. Also, they said it is important for those facing a similar diagnosis to reach out to others for support.